Leave the Yard Work and Head to the Beach! Flip, Float, Fly seeds on the Move by JoAnn Early Macken, illustrated by Pam Paparone. Holiday House, NY, New York, 2008. Flip, Float Fly is a lovely non-fiction picture book from which I learned what those weird looking seed pods are that I see sometimes on walks in my neighborhood. Locust tree pods. I don’t have a locust tree in my yard but I see them everywhere and now I know what they are. I love the tree’s fern-like leaves that seem to turn silver, quivering in the wind. Early Macken’s perfect prose tells how seeds get carried away and replanted in new places: by water, wind, and even bats: “A bat finds a feast in a fig tree and wings away with the seeds inside. The seeds pass through its body unharmed and fall to the ground in its droppings.” Squirrels hide acorns “…and bury them to eat later. But does it use all the food it collects? No. Lost acorns can grow into strong, shady oak trees.” My yard has a prolific squirrel population so when I’m digging in the soil I’m forever finding acorns the squirrels have “squirreled” away. The realistic acrylic paintings by Pam Paparone are a riot of color. One favorite page of mine depicts a garden with everything from carrots to roses. A small boy carries a potted hydrangea bigger than he and a small dog waits for a ride in a wagon. A seed package is tipped over in the corner, flower seeds spilling out. Several pages have easy to read diagrams of the parts of plants, such as the flower, fruit, leave, pod, etc. set off in a white circle so even the youngest child’s eyes will be drawn to them. The last three pages have diagrams of the parts of plants with definitions and notes on what conditions seeds must have in order to take root, grow and make more seeds. This is the perfect book to read to that young gardener in your family who is helping parents or grandparents with planting. There’s still time. I’ve been told you can plant spinach all summer. But I’m finished planting. Now to pull out the dandelions and pick the “helicopters” out of my containers. Or maybe I’ll just go to the beach…. 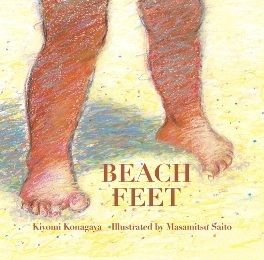 Beach Feet by Kiyomi Konagaya, illustrated by Masamitsu Saito. American edition published by Enchanted Lion books, NY, New York, 2012. Originally published in Japan, translated by Yuki Keneko. Although the boy’s feet are always the focus, the water practically splashes off the page in roiling waves. Saito grew up in a seaside town and his fascination with water makes this book a feast for the eyes. Reading this, I felt like I could almost jump into the water along with the little boy. I rarely get to the ocean, but once a year I try to swim in Lake Superior to play in the waves. Sometimes I even take an inner tube. This is the perfect “beach book” for the little ones just becoming acquainted with the beach.